Terry Schupbach-Gordon: "As an artist, I am deeply committed to the history and craft of printed images. Printmaking for me is the visual language that I speak. 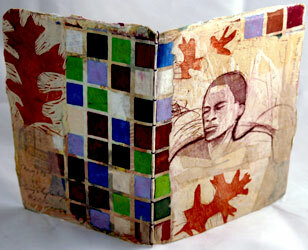 The works you see here are a combination of etchings, woodcuts, and drawings and are often in artist book form. 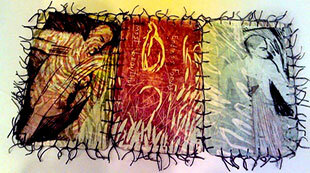 I piece and collage images much as a fabric artist makes a quilt. All the pieces use handmade papers and combine words and images, with the hope that they are clearly emotionally affirmative, even if the imagery is difficult. I love my craft and believe in its ability to translate my experiences into visual form. 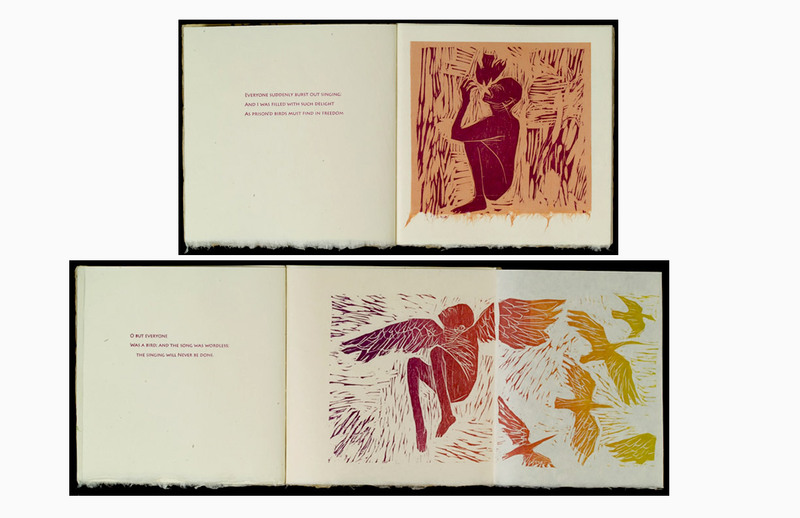 "As to the question of what I make and why I make it, I will say that all of the works are a combination of etchings, woodcuts, and are often in artist book form. 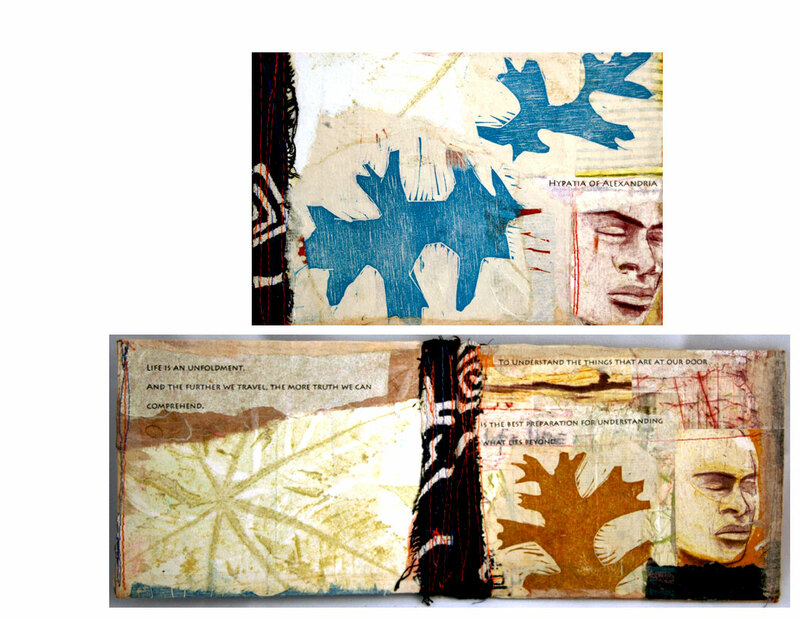 All use handmade papers and combine words and images, with the hope that they are clearly emotionally affirmative, even if the imagery is difficult. They are figurative, though often ambiguous in terms of gender, race or location. I make them because I love my craft. I keep working because what we make affirms what we hope for in the world. " Tobaccoville, North Carolina: Catbird (on the Yadkin) Press, 2019. Edition of 55. 5.25 x 10"; 14 pages. Typeset in Centaur and Bembo. Letterpress printed. Bound in St. Armand papers with Lakota end sheets. Pamphlet binding. Signed by Toby Gordon and Terry Schupbach-Gordon. Numbered. 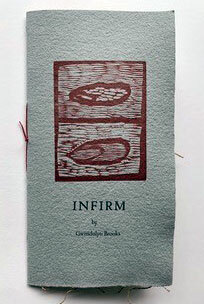 Infirm is part of a larger series of prints and books called "Claiming Grace" which address issues of disability, identity, and beauty. Terry Schupbach-Gordon: "The poem is a delight and as I quoted in the colophon ... it was printed 'with my own legs a-wobble. ...' Actually, that is a stretch, since I as a wheelchair user while printing on the Vandercook, it is my wheels that are a bit a-wobble reaching to insert the paper, but it made me smile, thinking both of my wobble, and as Gwendolyn says so beautifully, that we are all enough to be beautiful." Gwendolyn Brooks, Dickinson Electronic Archives: "Somebody wrote to the library and asked that I find books with poems featuring handicapped people for a conference that was going to feature handicapped people. So, I decided I was going to try to write such a poem myself. I have a certain way of feeling about handicapped people. I feel that we're all handicapped to some degree in some dimension, so under the title I wrote 'For handicapped all.'" www.poetry.foundation: "Gwendolyn Brooks is one of the most highly regarded, influential, and widely read poets of 20th-century American poetry. She was a much-honored poet, even in her lifetime, with the distinction of being the first Black author to win the Pulitzer Prize. She also was poetry consultant to the Library of Congress — the first Black woman to hold that position — and poet laureate of the State of Illinois." Tobaccoville, North Carolina: Catbird (on the Yadkin) Press, 2016. Edition of 55. 9 x 4.25"; 12 pages. 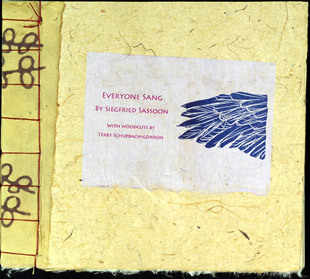 Endsheets of handmade paper. Set in Centaur and Bembo types. Kitakata and Rives papers. Woodcuts carved on type high maple blocks. 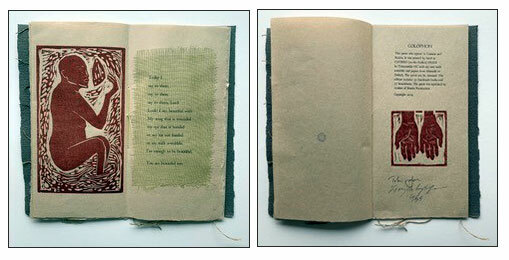 Handbound with pamphlet stitch in wrappers of handmade paper. Numbered. Signed by poet and artist. Terry Schupbach-Gordon: "A periodic cicada spends 13 or 17 years underground as a nymph. They have appeared in literature since the days of Homer and Aristotle. In song the cicada is a symbol of survival. In mythology, Zeus turned Tithonus into a cicada when he asked for immortality. In this poem by R.W. Rhodes, they scamper, climb, and fly with the wings given them by Toby Gordon." 4.5 x 4.5" closed, center fold opens to 14"; 8 leaves with of these fold-outs. Woodcuts by Terry Schupbach-Gordon. Set in Palatino. Includes a variety of handmade papers. Bound in paper wraps with spine a varied color paper matching the free end pages. Numbered. Signed by the artist and poet. 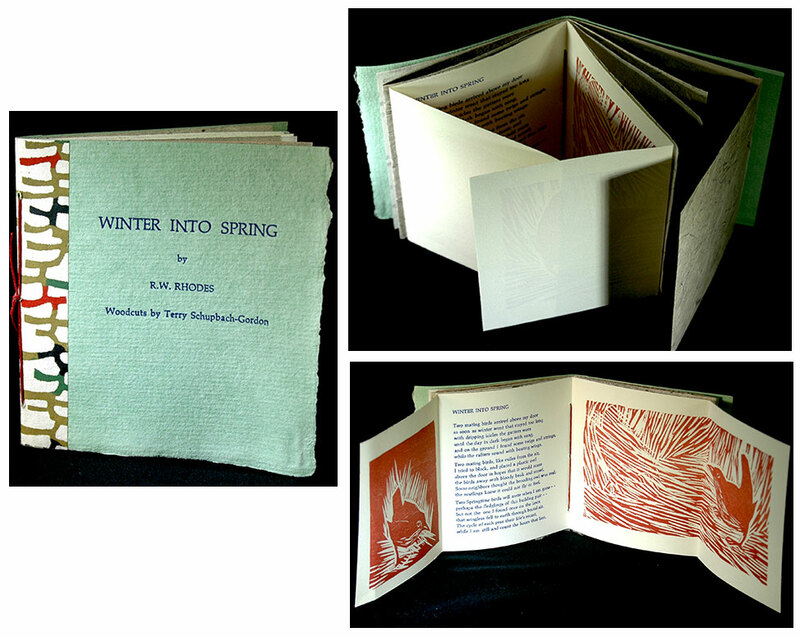 Terry Schupbach-Gordon: "This tiny book celebrates the spring, arts in the public schools, and a very large friendship. The poem was chosen by the third grade at the Arts Based School in Winston-Salem, NC for inclusion in their own Book of Hours project. After the third grade rolled the presses here in Tobaccoville, we went to work on our own version of 'Winter into Spring.'" Tobaccoville, North Carolina: Catbird (on the Yadkin) Press, 2015. One-of-a-Kind. 4.25 x 6.25"; 3 panel accordion. 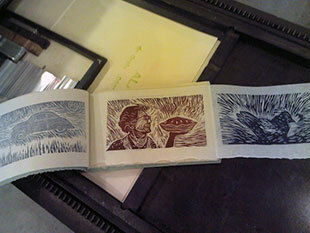 Woodcut and intaglio printed on handmade paper. Hand-stitched with waxed linen thread. Terry Schupbach-Gordon: "This small book is part of a series of one-of-a-kind books made to say thank you to the countless people who have strengthened my ability to love, create, and hope, and to describe why that is crucial to being human. This first little book is written to say thank you to Charles Darwin, who describes as beautiful all the multitudes of life forms as they exist and as they evolve. Thank you Charles." Charles Darwin, The Origin of Species: "From so simple a beginning endless forms most beautiful and most wonderful have been, and are being, evolved." Tobaccoville, North Carolina: Catbird (on the Yadkin) Press, 2015. Edition of 50. 10 x 5.75"; 16 pages + 4 fold out leaves. Letterpress printed using Tahoma 10 point typeface on Kitakata and Nideggen papers. Woodcuts by Terry Schupbach-Gordon. Bound in St-Armand paper covers. Japanese stab binding. Signed by writer and artist. Numbered. Terry Schupbach-Gordon: "I have known Bob for many years, sharing as we do a love of all things theater, puppetry, storytelling, and of course, a love of our time spent at Kenyon College in Gambier, Ohio many years ago. Over coffee and conversation while planning our 7th grade Haiku and handmade book extravaganza, we decided that we should ourselves collaborate on a project, and so we did. 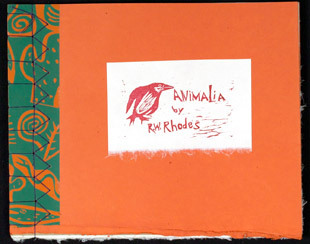 The book was printed on various handmade papers with covers from St. Armand paper mill in Montreal. It was bound by many hands some also holding many cups of coffee around a table here in Tobaccoville, NC." Robert Moyer: "From the thousands of books I read as a child, to the dozens of folk tales I have performed as a storyteller and director for over a million people, my life has been blessed with stories. From my teachers, Viola Spolin (author of IMPROVISATION FOR THE THEATER), and Paul Sills(creator of Story Theater), I learned to love stories, learned to shape stories, learned to share stories collaboratively. Now, with Terry Schupbach-Gordon, I have shaped and shared collaboratively for the very first time a story of my own, not a folktale." Tobaccoville, North Carolina: Catbird (on the Yadkin) Press, 2014. Edition of 60. 40.5 x 7.5"; 8 leaves including free end pages. Text printed in Trajan Pro on Nara Handmade and Iwami Natural papers. Bound in covers of St. Armand Blue Starry Night with pamphlet stitch. Signed and numbered by poet and artist on the colophon. 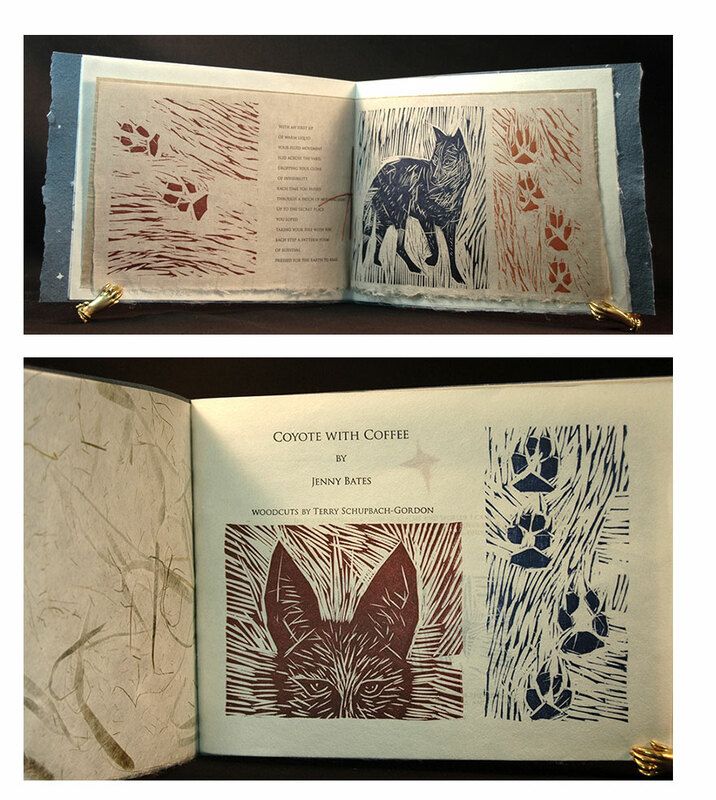 Terry Schupbach-Gordon: "This little book about a coyote, or rather a fleeting glimpse of a coyote, was made as the months turned from warm to cool and the coyotes gathered near the mighty Yadkin River to pause, or lope, or slide across the yard. This book included much coffee, joyous conversations, deepened and renewed friendships, and beautiful papers from Nara, Japan and St. Armand Papers in Montreal. We hope that you enjoy it!" 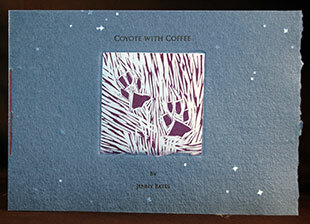 Jenny Bates: "I have always considered my writings to be a mirror of the natural world. Like the sea reflects the heavens indefinitely making it possible to discover hidden meanings in its reality. I hope to convey the symmetry between humans and fellow animals. Whether it be in the cycling of pulsating life or silent death. I hope those who read my poetry come to touch the world and the travails of totally different yet kindred beings and, as I do, feel less alone." Tobaccoville, North Carolina: Catbird (on the Yadkin) Press, 2012. Edition of 65. 8 x 9"; 2 pages. Woodcuts printed on Yatsou, Kitakata, and Japanese etching papers. Type is Trajan Pro Bold. 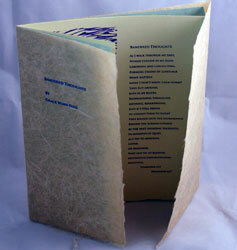 Sewn gatefold binding with covers of Brazilian banana paper. Numbered. Signed by artist and poet. Colophon: "The poem was written by Grace Winn Ellis who corralled these words after a walk at Tanglewood Park. 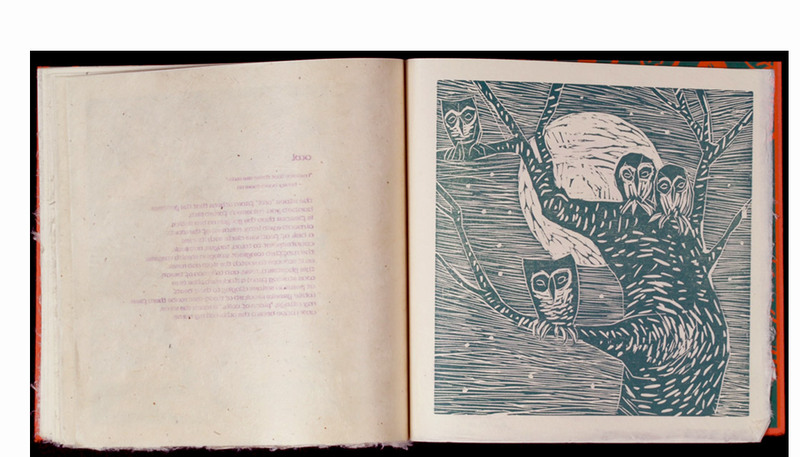 The woodcut is by Terry Schupbach-Gordon who is familiar also with bats, belfries, and distraction. " Grace Ellis recently started a blog, May 2012. Banished Thoughts was one of her first entries: "After years of quietly hoarding my opinions on the inner life, the public arena, books, and theater, I am sharing them with the wider world. I hope you will find something here that speaks to you. "Here’s a brief word from the fluttering thoughts that I am releasing into the world:..."
Tobaccoville, North Carolina: Catbird (on the Yadkin) Press, 2012. Edition of 58. 9.5 x 6.5"; 16 pages, with one fold-out. Printed on Okawara and Lokota Cornflower papers. Type set in Janson Text using polymer plates. Bound in paper covers (paper by St. Armand). Each book has a slightly different cover. 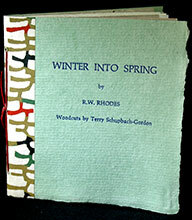 R. W. Rhodes: "As time and memory moved us, as friends sat together, we watched the bird feeders to which hummingbirds darted and an alphabet of other birds convened, and in the distance a neighbor's barn and ancient, wide-armed oak, and the far meadows beyond, as these were all illuminated at different times of the day, shadowing and lighting a playground of deer and woodland creatures, great and small – all part of the hymn of the universe. In writing these reflections, the spirited language of Rilke, the strict metric forms of Louis MacNeice, the resonant phrases of other poets, and the traditional cadences of the Book of Common Prayer for Matins, Evensong, and Compline all contributed to this evocation of rest and quietness on the wide, back deck of the village home of close friends. And another friend, the artist Terry Schupbach Gordon, has made these words alive in images. The wholeness of life and the hallowing we give and receive in friendship are the elements of the truly holy in the everyday ordinary." Terry Schupbach Gordon: "Time and memory and friendship also moved this book from Gambier, Ohio, to Tobaccoville, North Carolina, where the woodcuts were made, type and papers gathered, and the book was printed as the summer turned to fall and as we celebrated another collaboration with close friends. The book itself is printed in an edition of 58 in celebration of the 58 years of marriage of Don and Sally Rogan. The artist tried to print 60, but lost two in the printing ... call it chance if you will, I call it the power of love." Tobaccoville, North Carolina: Catbird (on the Yadkin) Press, 2010. Edition of 30. 9 x 6"; 12 pages. 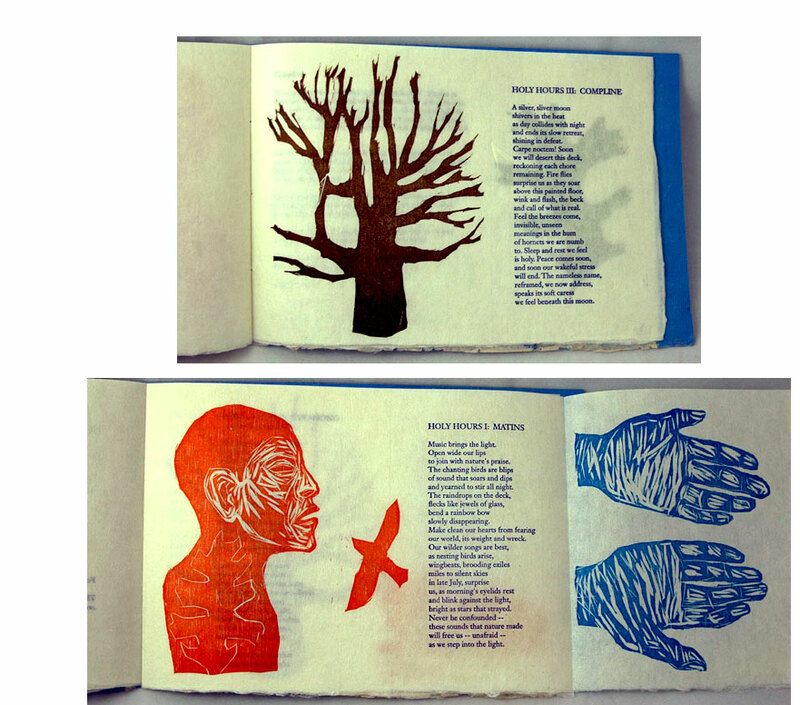 Woodcuts and handset type on handmade papers. 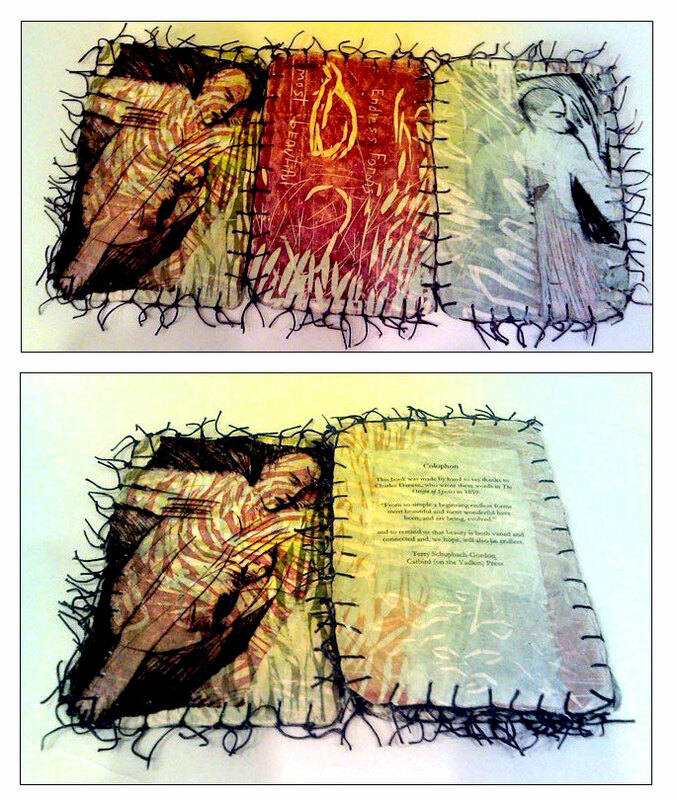 Illustration pages tipped on handmade papers. Illustrations by Terry Schupbach-Gordon. Sewn binding. Illustrated paper title label tipped on front cover. Terry Schupbach-Gordon: "This very sad poem was written by Francis William Bourdillon (1852 -1921). ... This sad poem actually made me quite happy because I found a use for several pieces of hand printed papers that I've had for many years. I had almost given up hoping to find a use for them, but now, my reputation as a pack rat has been justified!" Tobaccoville, North Carolina: Catbird (on the Yadkin) Press, 2009. Edition of 80. 12.5 x 10.25"; 36 pages. 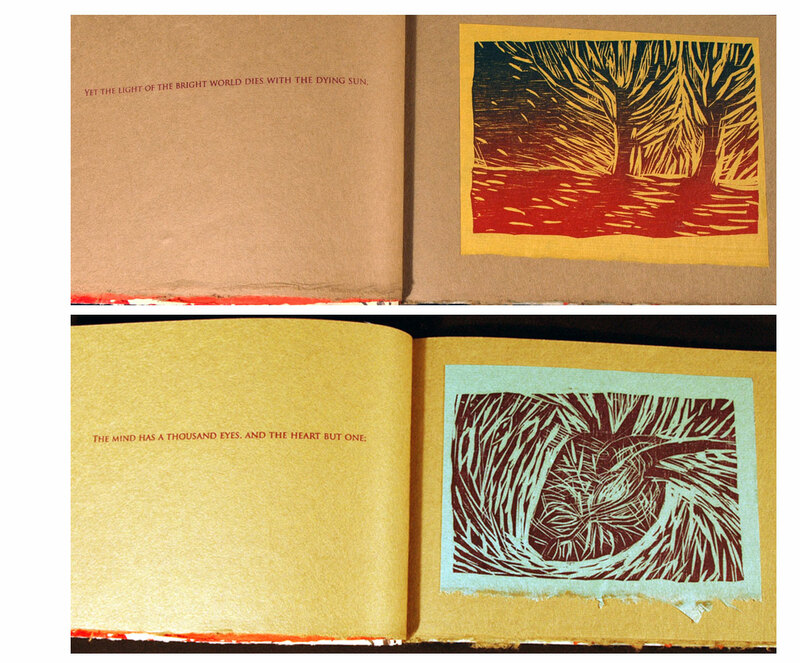 Woodcuts handprinted on Hiromi Yugen paper and Zimbabwe screenprint. Printed using American Unical type. Handbound using Japanese stab binding with waxed linen thread. 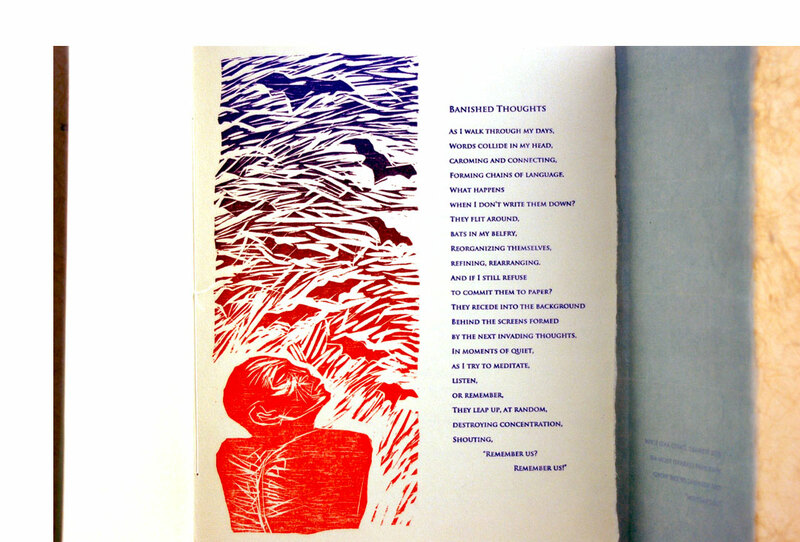 Terry Schupbach-Gordon: "This is a book of sonnets on various creatures of earth, sea, and sky by Royal W. Rhodes, poet and professor of Religious Studies at Kenyon College … with woodcuts by me. It was a joyous collaboration by two old friends and long time collaborators." Tobaccoville, North Carolina: Catbird (on the Yadkin) Press, 2009. Edition of 35. 9 x 8"; 20 pages. Woodcuts and handprinted type on Japanese papers, including Yugen and Kitakata. Type: Lithos Pro Light. Japanese stab binding with waxed linen thread. Illustrations by Terry Schupbach-Gordon. Terry Schupbach-Gordon: "Siegfried Sassoon (1886 - 1967) is best known as a poet of World War One. He wrote this poem in celebration of the armistice, just before he learned of the death of his friend, Wilfred Owen. This book was made in hopes that the beauty of these words will, like the singing, 'never be done.'" Tobaccoville, North Carolina: Catbird (on the Yadkin) Press, 2009. Series of 8 , each unique . 12 x 6.5"; 4 pages. 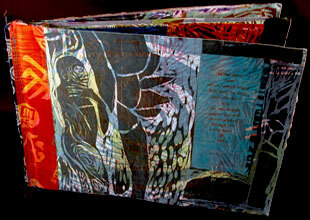 Woodcuts/intaglio printed and collaged on a variety of papers. Bound on sewing machine with cloth. Terry Schupbach-Gordon: "This book and its seven other 'sister' books were made to tell about what I learn in the garden. I am an avid gardener and lover of all movements beneath the ground. I have successes and failures, and most often, leave the garden uplifted and renewed. I love the poetry of Theodore Roethke, and these books are dedicated to his memory and his words, and to what he also learned in the garden. " Tobaccoville, North Carolina: Catbird (on the Yadkin) Press, 2009. One-of-a-kind. 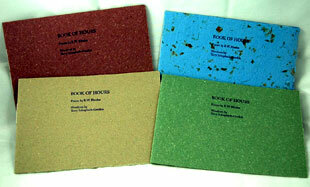 13.75 x 10"; 8 pages including front and back covers. 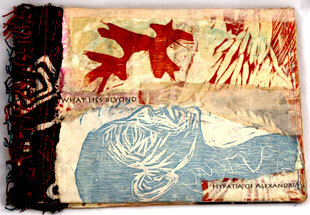 Collaged woodcuts (with a small bit of etching) and handset type on various handmade papers. Illustrations by Terry Schupbach-Gordon. Sewn binding with machine stitching and cloth. 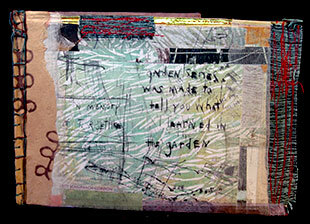 Terry Schupbach-Gordon: "[In Our Sleep] is a collage of woodcuts with some smattering of intaglio, and handset type. 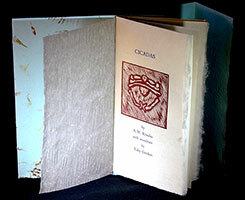 It was made in book form following a series of etchings using the ancient lines from Aeschylus. I had ended a difficult year...which included the death of my father, and was struggling to find words that expressed the moment that grief gave way to acceptance. I believed that perhaps if I etched the words of Aeschylus in copper or set it in type, perhaps my heart would follow. Indeed, it did. For me, making this book, and the prints that preceded it, was a little like planting bulbs in winter, believing that, even as we were surrounded by cold, in time we would enjoy their beauty and warmth." Tobaccoville, North Carolina: Catbird (on the Yadkin) Press, 2012. One-of-a-Kind. 7.25 x 5"; 2 pages. 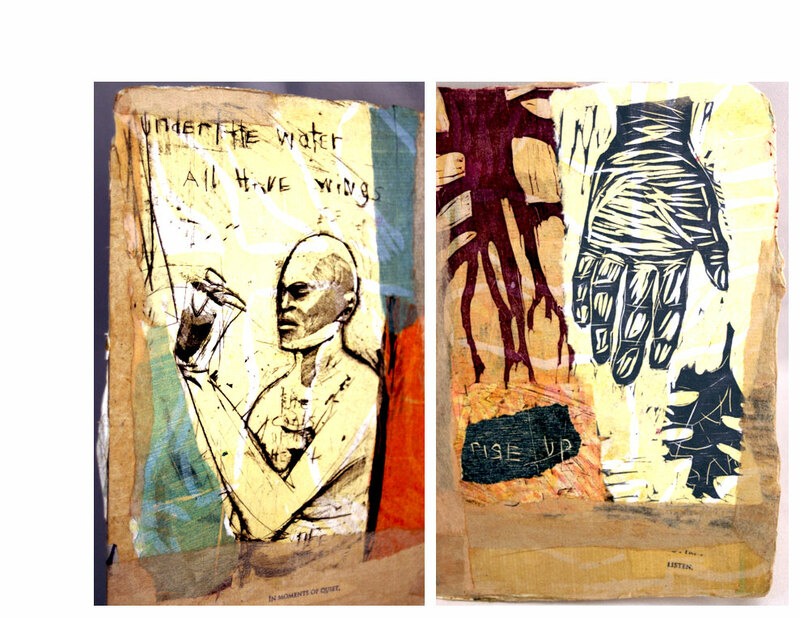 Intaglio, woodcuts and collage on handmade papers. Stab sewn binding. Terry Schupbach-Gordon: "Thoughts is truly that...some thoughts, while having some rare quiet moments to reflect, and a studio full of bits and pieces of prints waiting to become something more significant than they were as bits and pieces!" 7.25 x 5"; 4 pages. 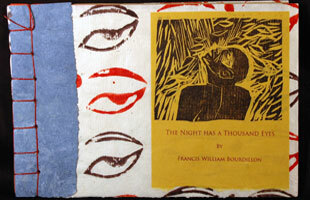 Intaglio, woodcuts and collage on handmade papers. Sewn binding with fabric and thread. Book consists of three paper-covered panels producing 4 internal pages, title on front panel, signature and date on back panel. Terry Schupbach-Gordon: "Hypatia of Alexandria, a woman mathematician and philosopher born around 350 AD with a most compelling life and sad death, whose many moving words seem so full of relevance today."